KT Ray’s on the Pond is a restaurant in Island Pond. Located in the down town district, they are close to the water, have outdoor seating, and have created a menu with a unique approach to simple crowd favorites. When we tried KT Ray’s, we came during the Friday Night Live music event. Island Pond was packed and parking was difficult. Luckily, at the end of the street is a large, free parking lot that serves the town, and the walk to the restaurant was short. Walking into this Island Pond Restaurant, the first thing I noticed was the smell from the kitchen – it was wonderful. A look around showed a clean space, brightly painted. It was apparent that this restaurant has been many things over the years. The over all style of the building reminded me of diners and breakfast places – comfortable enough but without any real theme or ambiance. The staff made up for that with smiles and personalities that stole the show. The outside seating area was quite cozy despite being close to the road. A lattice work fence added an aesthetic border with blooming flowers adding pops of color. Well placed tables made the small space feel larger and more open, and a flower garden held in a rock wall gave the space a focal point and added some visual interest drawing the eye towards the building and away from the street. Our server chatted with us and other guests at the bar as she went about her business. I ordered a glass of wine while my husband got a beer. At first service was slow, but there were a lot of orders heading outside. It took a while to get our food order in, but after that service was attentive and other orders were expedited quickly. 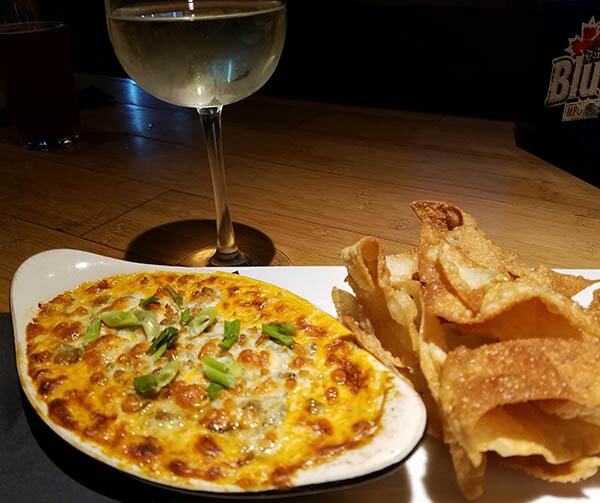 We started our meal off with the Buffalo chicken dip. This was a recommendation from our server, and is among the more popular dishes. It was delicious. The app was out quickly, and was placed before us bubbling hot. For me, there was just enough spice, but with a real flavor profile. 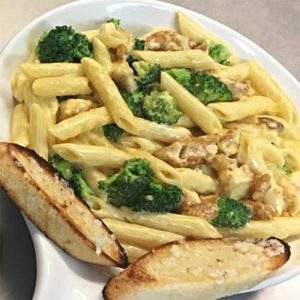 The Buffalo sauce was added to a creamy dip that helped cut the heat and the chicken was well cooked and shredded into easily consumed pieces. Our server told us that this dip is also used on a wrap that is among the best sellers. 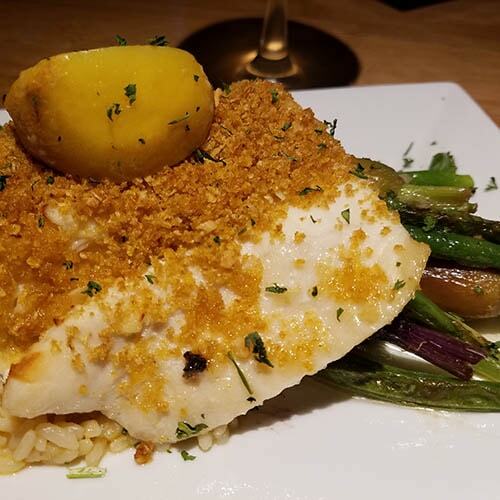 For an entrée, I ordered the garlic Parmesan crusted haddock. The filet was served over herbed rice with roasted vegetables. KT Ray’s didn’t skimp on the preparation of the sides. The rice was delicious with the herbs adding more flavor to the lightness of haddock. The vegetables were freshly roasted, not overcooked, and had also been seasoned. My husband ordered the Blueberry Lane burger. After asking about the best things on the menu, the owner explained that the restaurant features blueberries in a number of dishes (it is something they are known for). So we had to try one of these blueberry concoctions. The burger, served with a blueberry spread and brie sounded intriguing. It came out perfectly cooked to a medium rare. The thick slice of brie was warmed through and had a nice melted texture without being greasy, as can happen with melted cheese. 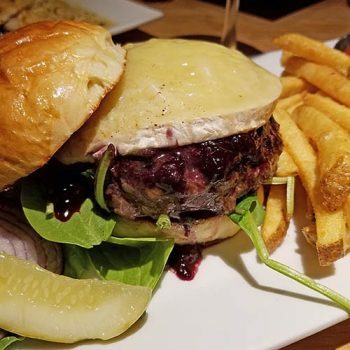 The distinct brie flavor paired well with the sweetness of the blueberries – add to that the crispness of raw spinach and the natural flavor of the beef and you have a gourmet burger combo perfect for a Vermont summer evening. This burger has a very fresh flavor profile which was a nice change from more savory gourmet burgers in the area. As I browsed through the menu – I was happy to see less fried food and more fresh and inventive options. I was excited to try their homemade chicken pot pie – but it had sold out just before we got there. That has been added to the “must try” list for my next visit. At dinner, I rarely order sandwiches. But I did a double take when I came across the chicken Caesar salad sandwich and the Blueberry Bacon. The Blueberry Bacon features Cheddar, fresh jalapenos, house made blueberry jam, and apple wood smoked bacon – just reading that made my mouth water. While we were eating, a large cut of prime rib came out of the kitchen. 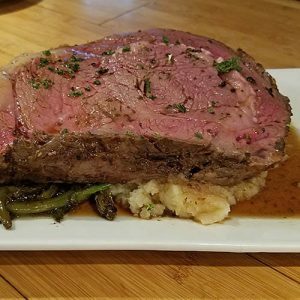 Friday nights are prime rib night, and it’s a portion you can really sink your teeth into. I was also impressed with the cook temperature. 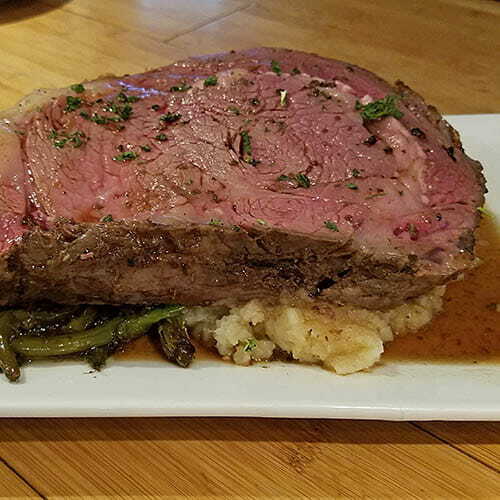 I have often seen prime rib overcooked as it is typically prepared earlier in the day and heated to order, but this cut was a perfect medium. Placed on top of mashed potatoes and roasted vegetables you could see the juice pooling on the plate, flavoring the sides below. I had wished, in that moment, that I wasn’t already too full to order one for us. 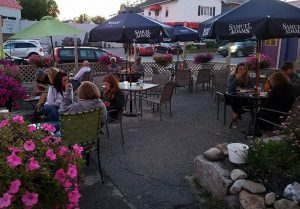 Every Friday night through the summer season, Island Pond puts on an outside concert called Friday Night Live. KT Ray’s is right next door so we were able to enjoy the music while dining. We opted to be inside at the bar, but a number of diners were eating outside and had a great view of the concert. This was our first time at KT Rays on the Pond, and we were very happy with our meal. I now have a list of menu items I am dying to try, and so know that we will be stopping in at KT Ray’s again, very soon.